The MATRIX M9 is an all aluminum (a stainless steel threaded insert is incorporated into the back cap for mounting to the firearm) lightweight muzzle suppressor is 1.25″ diameter, and 6.4″ long, and weighs 5.5 ounces, allowing it to cycle most ammo with the Beretta 92FS. Current db reduction is up to 33 dry, and over 40 db, when just a little water or oil is added to the suppressor. It requires the use of a special threaded barrel. We recommend the barrels made by Jarvis or Bar-Sto, and KKM as being the best for this use. We can supply these with the package, or thread your factory Beretta barrel for a nominal charge. Note: our suppressor really does attain low 30’s db reduction, and will for you too. Not like some of the others that claim high 30’s/lows 40’s db reduction dry, yet only manage high ’20’s db reduction when tested by independent sources. The suppressor is made of 2024 and 7075 aluminum,and is type III hard coat anodized for exterior wear resistance, the 300 series stainless steel thread insert is threaded 1/2″-28. The MATRIX GS is equipped with a Reactive Recoil Module (RRM), which allows the suppressor to cycle on guns that are finicky about cycling such as the Glock 9MM pistols. 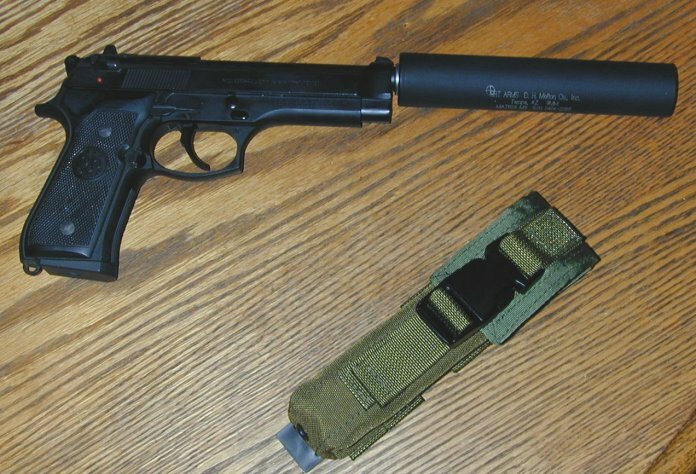 The RRM adds 1.2″ to the overall length of the suppressor, and the RRM reduces the sound level by another 2-3 db over the Matrix M9. Weight is 8 ounces with the RRM installed. Thread on the RRM is 1/2″-28. Lone Wolf can supply threaded barrels for your Glock. Neither version will allow cycling on pistols with rotating barrel actions.